Home » News » Is there a militant resurgence in Indonesia, the largest Muslim-majority nation? 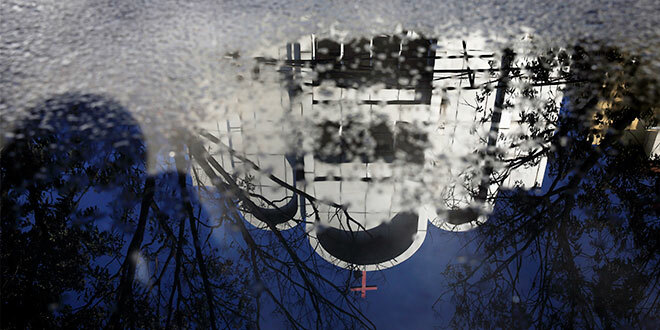 Devastation: The reflection of a church struck by suicide bombers is seen in Surabaya, Indonesia, May 14. Two days of violence left at least 18 dead and dozens injured. Photo: CNS/Beawiharta, Reuters. THE latest church bombings in Indonesia show the same trademark of fear that gripped the country almost a generation ago, and now once again threatens Christians, many of whom are from the ethnic Chinese minority, and make up about nine per cent of Indonesia’s 260 million people. Wind the clock back to Christmas Eve 2000. Orchestrated attacks on churches in Jakarta and several other cities killed about 20 people. A local group with links to Al Qaeda claimed credit. Then in 2002 Indonesia suffered its worst-ever attack – the Bali bombings when 202 people, including 88 Australians – were killed by al-Qaeda-linked militants in two bombings outside a bar and nightclub in Bali’s popular Kuta Beach. Pope Francis prayed for the repose of the souls of those who died in last weekend’s bombings and asked God to bring an end to hatred and violence. “I am particularly close to the dear people of Indonesia, in a special way to the Christian communities of the city of Surabaya who have been strongly hit by the serious attack against places of worship,” the Pope said on May 13. Bombings and targeted killings became so frequent that Indonesian authorities didn’t just hunt and arrest the culprits, they were forced to launch a de-radicalisation program that focused on altering the mindsets of Indonesians and providing alternative incomes for some released militants. Since the Bali bombings, Indonesia has imprisoned more than 800 militants and killed more than 100 – but authorities have not had great success in reforming them. In 2008, three of the Bali bombers, Imam Samudra, Amrozi Nurhasyim and Huda bin Abdul Haq were executed by firing squad. Two years later another Bali terrorist was killed in a police shoot-out. Perhaps the biggest fish to land in jail has been the radical Muslim cleric Abu Bakar Bashir, described as the ideological godfather of a movement to turn South East Asia into an Islamic state. In 2011, he was convicted of supporting a jihadi training camp following a four-month trial and was sentenced to 15 years in prison. However he was acquitted of the charge of involvement in the Bali bombings. In recent years the so-called Islamic State has emerged as the drawcard for would-be jihadists. A series of explosions and shootings in the capital, Jakarta, in 2016, were claimed to be carried out by the Indonesian-based Jamaah Ansharut Daulah (JAD) militant group, which had previously pledged allegiance to IS. A year later, Indonesia’s military chief General Gatot Nurmantyo said IS had spread to almost every province of the country. The current generation of radicals have largely gone under the radar of police. They are either newcomers who became indoctrinated via the Internet and jihadist sites, or followers of the old radical movements but with few ties with the older generation, making it hard for investigators to track them. Up to 30 Indonesian groups are known to have pledged allegiance to IS with some previously voicing ambitions to set up an official IS province in South East Asia. Hundreds of Indonesians are also believed to have left the country to fight with IS in Syria and Iraq. While many top militant leaders have been either killed or captured, IS-inspired cells exist and are a continuing threat, influenced by leaders both at home and abroad. JAD leader Aman Abdurrahman is believed to command significant influence among jihadis in Indonesia, despite being detained in the country for the past 12 years. He is on trial for inciting followers to commit acts of terrorism while behind bars at a detention centre which has been described by analysts as a breeding ground for pro-IS militants.